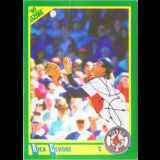 Richard Aldo Cerone is a former Major League Baseball player from 1975 to 1992 for the Cleveland Indians, Toronto Blue Jays, New York Yankees, Atlanta Braves, Milwaukee Brewers, Boston Red Sox, New York Mets, and Montreal Expos. Cerone was primarily a catcher. New Response (Success): Sent LOR, SASE, and 4x6 color photo and received i..
New Response (Success): 10 cards 1/10 signed in nice sharpie. Returned th..